These are lyrics by Cold that we think are kind of repetitive. 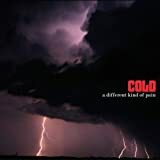 Cold's, "A Different Kind of Pain"
I remember when Scooter's lyrical ability was awesome. The chorus of this song consists mostly of the title, and that's sad.